When working with very small or very lightweight materials, issues can arise with taking measurements. Many scales are not designed to properly weigh items below a certain weight. For these items, gram scales may be needed. 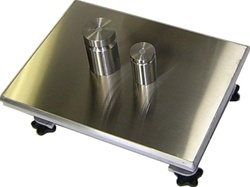 With a platform scale, items are placed on a flat surface to be weighed. The platform senses the weight of the object and transfers it to the display. With a digital display, other functions or calculations may also be available. Many platform scales are designed for larger items; however, there are platform scales that are capable of weighing in grams. A hanging scale generally works by a mechanism that has a hook on each end. One hook is used to hang the scale and the other hook is used to hang the item to be weighed. If the item cannot hang on the hook, a pan can be used. The pan is hung from the hook then the item is placed in the pan. In this case, it is important to subtract the weight of the pan from the final weight. The hanging mechanism is used to determine the weight of the object. Some hanging scales are large and sturdy to weigh heavy objects. However, there are smaller versions of hanging scales that are designed to detect weight in grams. A bench scale is very similar to a platform scale but much smaller. The object to be weighed is placed on the platform which is generally 12Óx16Ó. Standard weight capacities range from 4lbs up to 150lbs and are also able to display weights in grams. Even when considering something so small that it needs to be weighed in grams, there are many different reasons for using gram scales. The different types of gram scales each work better for different situations. There are various others types of gram scales that have not even been mentioned. Finding the correct type of gram scale for the situation can be a daunting task. If you are not familiar with gram scales and their uses, it can be hard to determine which one would work better for a particular situation. However, the wrong scale can make a task much harder or even impossible to complete. If you have a situation that requires the use of gram scales, contact Arlyn Scales at www.arlynscales.com today!. Our knowledgeable staff can discuss your particular needs to help you decide which type of gram scale would work best for your purposes. Through the information they provide you can make a choice with confidence.